As The Place To Go When There's A Party"
Does it bother you that you have no idea what a Dirty Martini is? Are you embarrassed when you have no idea whats in a Cosmopolitan? Do you wish you had incredible bartending skills so everyone wants to come to your party instead of someone elses? Its not last call yet weve got the answers you want. Historically, some people have had a particular fondness for liquor. This is an enormous benefit for those who want to pursue bartending as a career. It can also be great fun for those who love to host their own parties. People want their drinks and prohibition proved that absence of product doesnt lessen the demand. Tending bar involves much more than just making drinks. This is especially true if youre heading towards a career in the business. The job includes customer service, management, security, and sometimes, psychiatrist! Dont go into this venture clueless. Learn Everything You Need To Know In This Book! 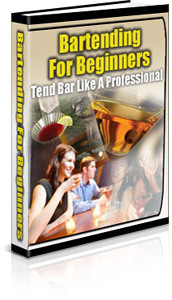 Our e-book, Bartending for Beginners is a simple, easy-to-use guide that will teach you more than your inexperienced counterparts. When you go into a job, you want to be armed with as much expertise and information as you can possibly find. Bartending for Beginners is an easy-to-read, simple guide to learning all of the basics that the pros already know. This book is written so that, if you want to make money as a bartender, youll be ridiculously successful. If you just want to impress your friends, youll be the talk of the town! Bartending has put food on tables, paid for college tuition, and made successes out of people who thought they had no direction in life. Sure, tending bar isnt always thought of as a noble profession, but Listen to what one customer said after he read this book. Even if you dont want to make a career of tending bar, this book is for you too. So many people love to entertain in their homes. They pride themselves on giving their guests superior service believe it or not! Exuberant hosts just want their guests to be happy. That includes being able to make them whatever drink they want. There are literally thousands of drink recipes to be made and many more to be concocted. Plus, youll get a crash course in pouring a shot that everyone will remember the next day and beyond! Mixing drinks in a shot glass can be a beautiful experience! Can you make any of these shots? Once you read Bartending for Beginners, youll know how to make all of these shots, drinks, martinis, and more! You actually will be amazed at over 50 recipes ready for you to use all on your computer at your fingertips! What else makes a good bartender? A great personality and a fun demeanour sure doesnt hurt! People expect those who serve them drinks to show them a good time. That doesnt mean that you have to get personal, you just have to be personable. It doesnt hurt when you know a few jokes and tricks to impress and awe your customers or friends. We Found Some of The Best Jokes and Tricks Around! Have you heard the one about the talking mice? How about the one about the Irishman, the Italian, and the Polish guy? Sure, theres a million of them out there! Weve got some jokes that some people will love and some people will roll their eyes at, but theyre sure to remember the person who told them that joke! Bar tricks can be a great way to get free drinks or make a little money. Do you know what to do with an olive and a brandy snifter to wow your customers or friends? We can show you! How about being the life of the party with two little quarters and a little know-how? Weve got the answer! Well show you 12 different ways to amaze and awe those you are serving. If you can make a little money on the side with some bets that that cant be done, whats wrong with that? Well give you the set-up, the procedure, and the result! Itll be a Boo Yah moment for sure when you pull these tricks out of your hat! But drinking isnt all fun and games. Its a serious business when someones faculties are being impaired and youre the one who is helping to impair them. You must know when its time to say enough is enough to one of your friends or customers. Were giving you this information too!